Out of Alba, Kennedy's Kitchen, Gerry O'Beirne & Rosie Shipley, Scott Boswell, Ciana, Spencer Murray & Pipeslinger, Enda Seery, Talisk, Caledonia Swing, Beer Belly, The Bringers, Gillian Boucher, Coole Park, New Shilling, Sprag Session, Oisin McAuley. Remember also to Subscribe to the Celtic Music Magazine. Every Thursday, I'll send you 4 or 5 cool bits of Celtic music news. It's a quick and easy way to plug yourself into more great Celtic culture. Plus, you'll get 34 Celtic MP3s for Free, just for signing up today. Thank you again for being a Celt of Kindness. 31:25 "Soldier's Joy" by Caledonia Swing from Something Like That! 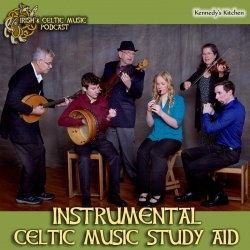 Also see: iNSTRUMENTAL cELTIC mUSIC sTUDY aID and our 3-Hours of Instrumental Celtic Music. I have links to both of those episodes on YouTube in the shownotes. The 2019 Stickers are now available in our store at MageRecords.com. I want to thank our newest patron of the podcast: Keith B., Kimberly J., Richard B., TolkienFan4Ever, Randall 5th A., William B., and a big thanks to Robert M. K who raised his pledge. Jeffrey Spero of the Syncopaths emailed a thank you: "Hi Marc... I just wanted to offer a thanks for your Thanksgiving podcast. I received an email today from one of your listeners who told me that he purchased a copy of our Five Gears CD specifically because he heard a track from it on your podcast. You are doing wonderful work to expose the joys of Celtic music to your listeners, AND to help out the independent artists. Bravo, and much appreciated!"